Greetings from CAPACES Leadership Institute! – TURNO becomes RE-TURNO: Trades are encouraged! Meet José García, our newest team member. 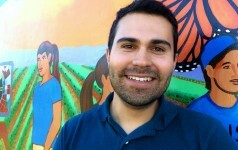 José is a recent graduate of Western Oregon University where he studied Business. He was involved in the Multicultural Student Union and MEChA. He will serve in RE-TURNO alongside present Program Coordinator Abel Valladares. Jose is excited to serve with RE-TURNO because he will be able to offer the valuable guidance and mentoring he found to be lacking when he attended high school in Salem. Eventually he would like to be a high school teacher, and he knows his experience with RE-TURNO will provide critical insight and experience enabling him to be an excellent educator. RE-TURNO youth program is kicking into full gear. The foundation of the TURNO program we’ve ran for the last three years is still going strong: TURNO is all about leadership, identity, and higher education. RE-TURNO adds an additional component: Job readiness and trade apprenticeship. RE-TURNO stands for Reenforcing Education – Talento Universitario Regresando a Nuestros Origenes. CAPACES teamed with Woodburn School District, Chemekteta Community College, Pacific University, and a list of local trade businesses to establish a pipeline for students to move from high school into college or a trade. Local businesses will provide apprenticeships and students can earn corresponding certifications, provide valuable work and resume experience, and recommendations for future employers. 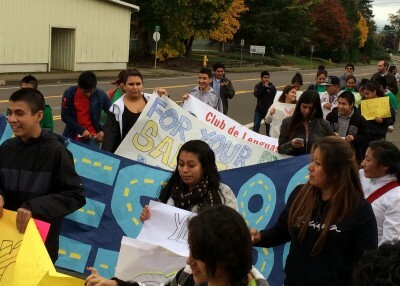 Last week RE-TURNO students and the Club de Lenguas Indígenas from Woodburn High School carefully organized a march. On these students’ day off, they stood for what they believe in: That all Oregonians need a safe and legal way to get to school, work, and church. Thirty students marched more than six miles, first shying away from the megaphone, than eagerly awaiting their turn. Encouraging more citizens to vote yes on Measure 88 meant something profound to these students, and they were willing to stand for what they believe in. Before marching, Ramon Ramirez, President of PCUN farmworker union, led students in discourse about protests, marches, how to interact with police, and how to respond to combative bystanders. CAPACES Leadership Institute’s mission: to prepare leaders with the political consciousness and skills needed to lead and support social justice work. The students’ initiative caught the eye of Oregon Senate President Peter Courtney. He plans to meet with all the students who participated to speak with them about the importance of civic participation. We are proud of our students’ initiative, leadership skills, and conviction to do what is just. Please include CAPACES in your holiday giving and support programs including RE-TURNO. We are seeking 10 new monthly sustaining donors this year; will you please consider making a monthly donation? or contact us if you would like to arrange a different form of donation. A special thanks to all who came out and volunteered at the work brigade last Saturday in honor of Monica Smith. We are grateful and honored by her legacy and your involvement in the community.